Verbs give sentences their power, but some verbs are more powerful than others. Vivid verbs create a clear picture of what the subject is doing, while dull verbs give a general, vague view. A dull verb tells you that Dakota and Maria go down the hill, but a vivid verb shows how Dakota and Maria glide down the hill. Your Turn The following paragraph contains many dull verbs (in bold). Replace the dull verbs with vivid ones. If you get stuck, use a print or online thesaurus to find specific and lively verbs. One snowy afternoon, Dakota and Maria met at the bottom of a steep hill. They went to the top of the hill with their sled. The sledding conditions were perfect. Fluffy snow covered the ground and came from the sky. 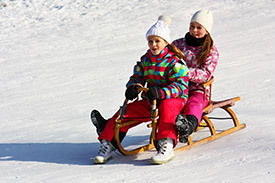 The two girls got on the sled and pushed off, first moving slowly and then picking up speed. Faster and faster they moved down the hill. Before long, Maria saw a big bump ahead and said, "Get ready! We're heading straight for that jump!" She was right. Their sled hit the bump head on, went airborne, and landed with a thud. Both girls fell off the sled and rolled to a stop. With their faces covered in snow, they got up, laughed, and shouted, "Let's go again!" Replacing Dull Verbs with Vivid Verbs by Thoughtful Learning is licensed under a Creative Commons Attribution-NonCommercial-ShareAlike 4.0 International License. Based on a work at k12.thoughtfullearning.com/minilesson/replacing-dull-verbs-vivid-verbs.